If you’ve never been exposed to a hidden object game before, the concept is as simple to understand as a youthful game of I spy or finding Waldo hidden within the pages of a Where’s Waldo? book. Imagine your bedroom is contained in a snow globe. Someone takes it, shakes it for a minute or two, sets it down, and at that point you’re presented with a list of items you need to find within the mess. 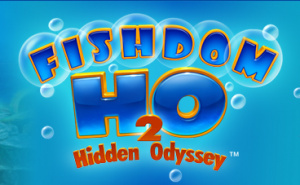 That’s exactly what these games are like, but in Fishdom H2O: Hidden Odyssey, you’re searching through mass amounts of human clutter at the bottom of the ocean floor. It functions as you'd expect; you drag the screen around with the stylus and, once you've located something that you're looking for, tap on items. Often the game has a touchy time deciphering between a dragging movement and a screen tap; it’s nothing crippling, but it can be frustrating, especially during the gold rush games that require you to tap on as much gold as you can within a minute. The other types of objectives include finding 12 various items scattered about, searching for any one of three items as quickly as possible, and collecting a certain amount of the same type of item littered about the scene. 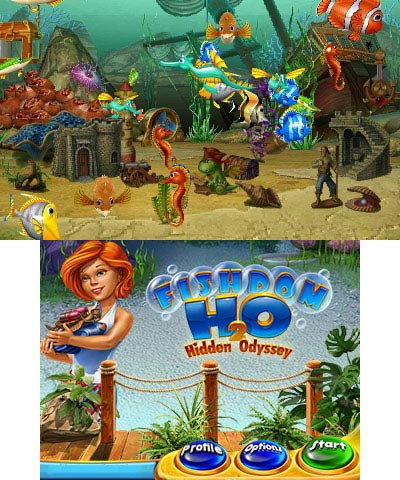 Fishdom H2O isn’t only about scouring messy environments for various items, though; it’s also about decorating and populating three themed fish tanks. 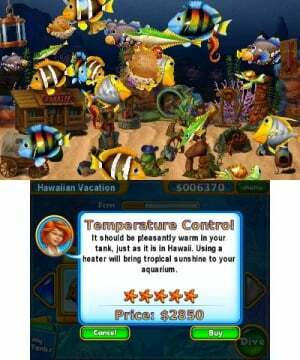 You earn money by playing the hidden object games, and this cash can be used to purchase fish, decorations and equipment for your tank. 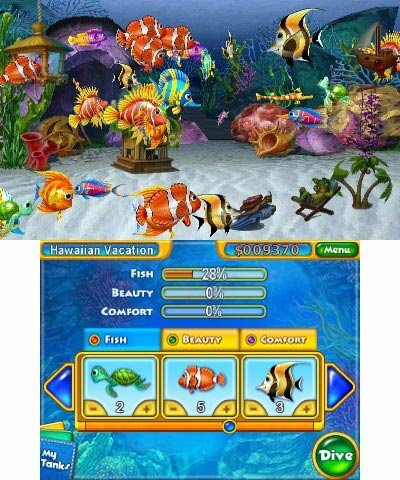 The goal is to reach a 100% rating in all three categories: fish, beauty, and comfort. There isn’t much customisation here, since you can’t even choose the placement of the decorations; this mode is merely the glue between your object hunts, and the reason there is any sense of progression. Luckily, the fish have a bubbly cuteness about them and the decor for the tank is equally fun. This should all certainly appeal to small children, though some of the searches feature obscure items that many won’t be familiar with, complicating things for the target demographic. The production values are rather good, featuring very bright and vivid colours, and even the small bits of story delivered by mostly still-frame cinematics are pleasant to look at — that is, as long as you can handle the laughably bad dialogue and delivery. The music is also satisfying as it genuinely complements the underwater atmosphere quite well. Think of the ambient, tranquil audio featured in the water levels of the original Donkey Kong Country, and you won’t be far off. In fact, there is one song in particular that sounds effectively similar, and it provides a nice comforting moment or two throughout the experience. Don’t go downloading this one anticipating a David Wise-level of quality from the soundtrack, however; it’s not that spectacular, but it is particularly pleasant. Once you’ve earned star trophies for each of the three aquariums – it took us about an hour and a half to accomplish this – you can continue to play further to obtain enough money to purchase everything available for your fish tank, thus earning you a cup for the most impressive themed aquarium in existence. More than anything, this truly does feel like work. It’s because, by that point, you’re stuck to repeating the same searches of the same scenes, over and over. We tried to accomplish this at a relaxing pace, but after 15 minutes or so, we found ourselves slogging through at a blistering speed just to wrap it up. And that’s the biggest problem with what’s here; the object searches repeat themselves not long into the experience, and the game dulled as we quickly became familiar with the placement of certain things. On top of that, these play exactly like they do in nearly every hidden object game before it, and at this point the lack of ingenuity and absence of fresh ideas is getting stale. Additionally, we did fall victim to a few errors that required a restart of the game, though thankfully, our save data remained intact upon restart. Initially Fishdom H2O: Hidden Odyssey shows glimpses of promise with its welcoming presentation and slightly unique fish tank decorating element, but ultimately this idea feels half-baked and doesn’t cohesively come together to deliver a unified experience. It’s not a bad game, per se, it’s just drowning in a familiarity that anyone previously exposed to the genre is likely to be underwhelmed with at this point. This is the type of game that would suit as entertainment for the family on a two hour road trip, most likely never to be touched again afterwards. Dive in if you must — just expect a shallow experience. I'm interested in this one, thanks for the review... It will be in my "impulsive buy with spare change" list. And the comments just keep coming! Only kidding. This game gives off a shovelware vibe and I'm not surprised about the score either. @Jumpman: So, every average (5 stars) game is shovelware? Wait, let me rephrase that... Is five stars a shovelwavery score to you? Shovelware means that it's average. It means that there isn't anything special about it and that there are heaps of similar games. So, yeah, I'd say that 5 is the perfect shovelware score, although the question was directed at somebody else. @Morphtorok Everyones entitled to their own opinion. @KeeperBvK Thanks for saying exactly what I was thinking. Personally, I wouldn't call an average game (on this site, 5/10) shovelware... but only just. I mean, it sounds competent. Shovelware, to me, implies brokenness in some way, not just mediocrity. Mediocrity teeters on the edge of shovelware, but ultimately is just above it. Someone could possibly derive enjoyment from this game, and I wouldn't think they had suffered head trauma if they did.